With a style that is very different to what British sheds usually offer the, 8′ x 8′ Windsor Groundsman Dutch Barn Shed really is something that is very unique and special. While clearly this is one of the most attractive looking sheds you can get. It is also very spacious inside. 8 x 8 is a very nice amount of storage room to have at your disposal, but the height is well over 8 feet, giving you a lot of room to store things high or even just to make sure walking around inside here is comfortable. The shed has a large double door that makes getting your things in and out very easy and there is even a window that can be opened so if you are working hard in here, you can get some fresh air into the shed. This is not a structure that is trying to get by on just its looks. It is also very robust thanks to being made with some very top quality materials. The outside of the shed is made with tongue and groove shiplap cladding which stops the water getting inside. The roof has a great dome effect to it stopping the water from sitting on top and also looking amazing in the process. Under your feet you will notice that the floor feels very secure. This is because it is made with tongue and groove boards that are supported with pressure treated floor joists. Very few sheds manage to leave us speechless with our jaws left wide open, but that is just what the incredible, 8′ x 8′ Windsor Groundsman Dutch Barn Shed did. 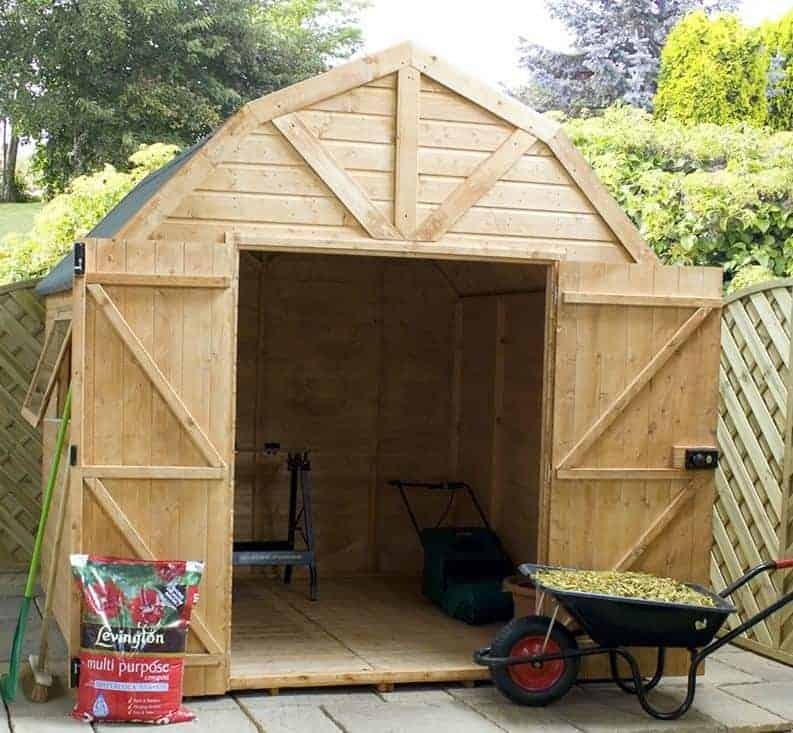 This is one of the best looking sheds we have ever seen and the Dutch barn design that Windsor have gone for really does set this apart from all the other sheds on the market. At 8 feet wide and 8 feet deep, you have a lot of floor space to make use of. But one of the other appealing aspects of this shed is the headroom. Because of the design, you have an amazing, 8 feet 7 inches of height along the ridge which gives you more than enough room to store really awkwardly large items. The roof as we just mentioned is very high and the design of it looks just absolutely fantastic. Rather than being a traditional apex or pent style roof, we have something that more resembles a dome than anything else. We really do think this looks amazing and as it is made with 12 mm tongue and groove boards and covered with felt it is also very strong as well. We are sure many of you fell in love with this shed the moment you looked at that first picture and what makes this such a nice looking shed is the 12 mm thick, tongue and groove shiplap cladding. Windsor have used this because of the way it fits together to create a very waterproof structure and also because it looks incredible. This is a shed that is every bit as strong as it is easy on the eyes. It is also very robust and a huge part of that is the frame which Windsor have used. At 27 mm x 45 mm the frame gives the shed a lot of strength and ensures that it stays very firm. 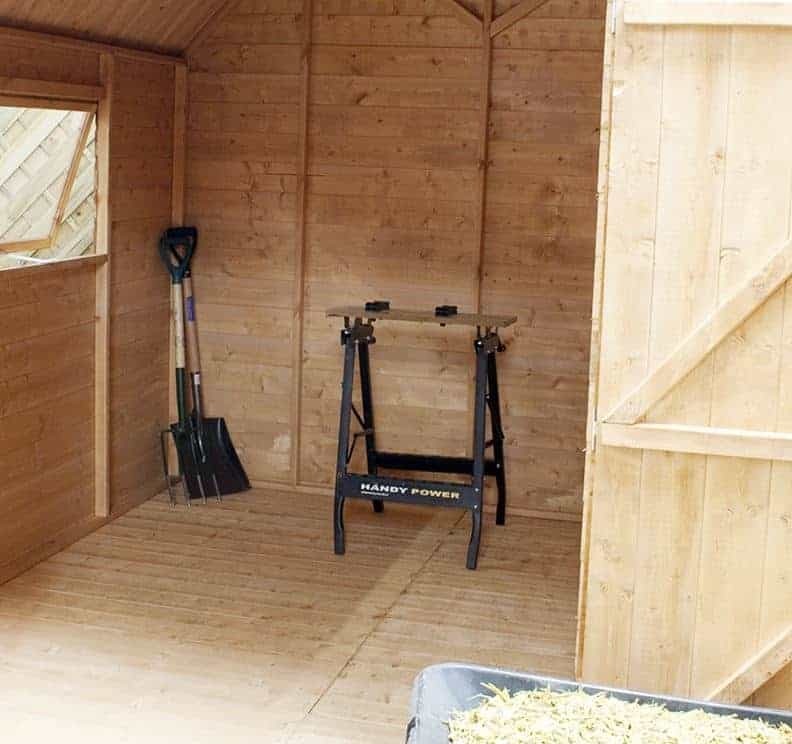 This is a frame which will do its job very well and do it so well that after you have spent some time in the shed we are sure you will not even notice it is there. The floor really did impress us a great deal. Made with 12 mm thick tongue and groove boards, just like the roof. These floor boards not only can take a lot of weight, but they fit in very well with the design of the rest of the shed. One thing we have to mention that you cannot see in the pictures is what is under these floorboards and that is some high quality, pressure treated floor joists. A free basecoat treatment is applied to all of the wood, but you will still need to give it a generous coating of wood treatment once it has been built. Some people will say that the basecoat will protect the shed for around the first 6 weeks, but we always say it is better to coat it sooner than later. A fresh coat once a year should be applied to the wood to keep it looking as good as the day you built it. 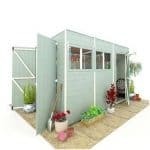 The 8′ x 8′ Windsor Groundsman Dutch Barn Shed comes to you with a 10 year anti rot guarantee. Windsor do many things right with their sheds and one of those is the fantastic guarantee they always give. As you can clearly see from the pictures the door on this shed is huge. They have gone with double doors that are a very impressive, 4 feet 5 inches wide and 5 feet 10 inches high. Each of the doors is kept in its place with three strong hinges and one of the doors has a proper handle to ensure they close securely. On one of the sides of the shed there is a very nice window. This is a well crafted window that can be opened so you can let some fresh air into the shed. The windows is made from high quality styrene so there is no worry about broken glass every getting in the shed. If you look closely at the door you will notice that there is an actual lock on it. We really love this as it saves you the time and money of buying and installing a padlock. Once you have finished inside here, you can make sure your belongings are safe by locking up the shed. We really like the window that is on the side of the shed and it is not right on the front so it is not exactly showcasing what you have to the world. If you do happen to install the shed in a position where the window is facing the street then a set of curtains or blinds would be a way to give yourself a bit of privacy and stop the nosy neighbours from being able to look in. We feel that because of the very unique Dutch barn design that this is a shed that is just fine the way it is. Still if you do want to make it fit in with the rest of your garden furniture then one way to do this is with a coloured wood treatment. An installation service is available, but at £249.99 it is on the pricy side. 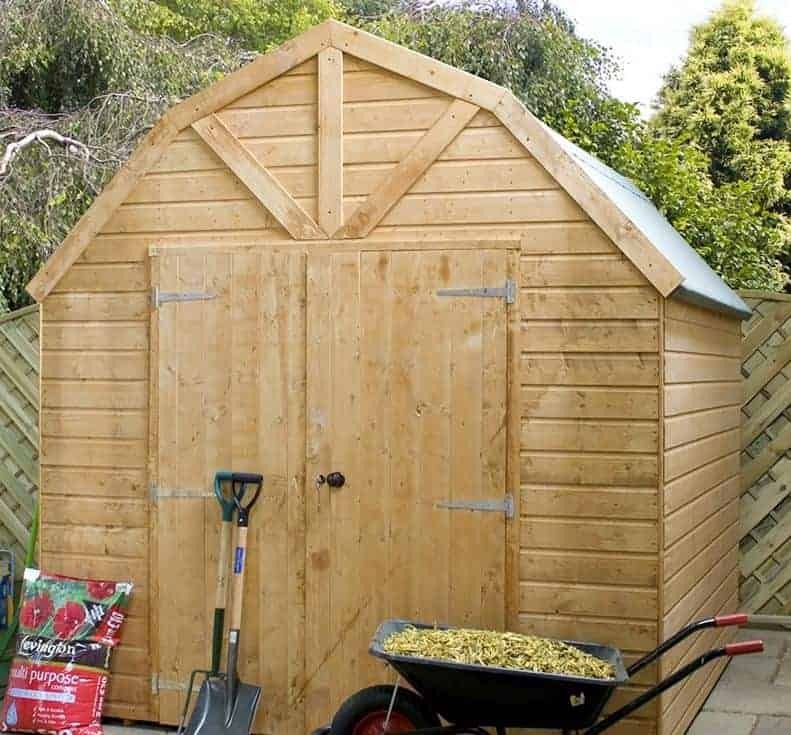 This is really the only extra that Windsor are offering with this shed as there really is nothing else extra you need for it. We love how high quality this shed is in not just its looks, but also in the materials used to build it. While you will have to roll up your sleeves and treat the shed once a year. Doing this will make this something you can use for well over twenty years. 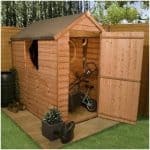 8 x 8 is not what we would call a large sized shed, but you do have all that extra height which you can make use of. Also by the shed being 8 x 8 it is something that even smaller gardens are going to be able to handle. As this shed is very high you will need help from a friend to build it. As long as you take your time, do what the instructions tell you and try to enjoy it then you will have this built in 5 hours at the very most. 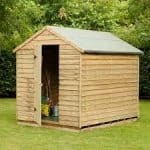 While not what we would class as a cheap shed, we feel this is great value for money due to the design and the materials which Windsor have used. 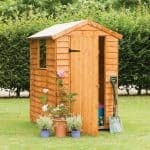 Final Thoughts: The 8' x 8' Windsor Groundsman Dutch Barn Shed is a structure that we are sure many people are going to purchase based on its looks alone. Luckily this is not just a structure that is good looking as it is a very well made shed that is going to last for a lot of years. We really do not have anything bad to say about this shed. 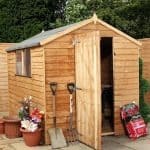 It has a very cool look that is different from the other sheds out there and of course as this is made by Windsor it is just high quality, through and through. 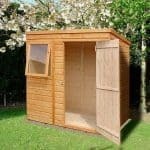 If you want a shed that just oozes style and also offers you a very decent amount of storage space then this is a shed we are sure you will love.